❀ Vendredi 21 juillet, 19h, Saessolsheim, salle polyvalente, concert de pianoforte par Michel Gaechter. Œuvres de Mozart, Beethoven. Pianoforte Théo Kobald, copie de Walter 1795. 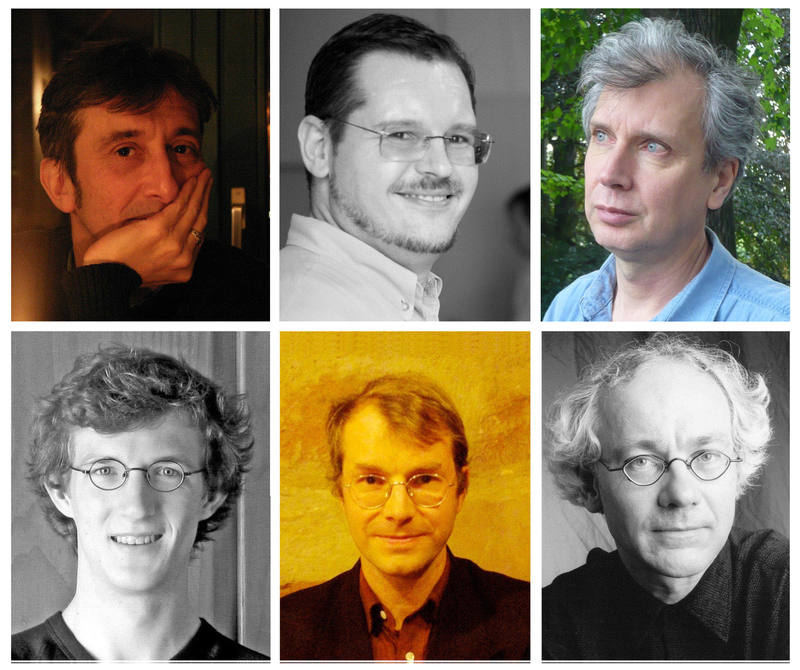 ❀ Jeudi 27 juillet, 19h, église de Saessolsheim, concert d’orgue, pianoforte, par les 6 professeurs du stage. Musiques baroque et romantique. • Ettendorf : orgue Rinckenbach (1908, pneumatique, 22 jeux). 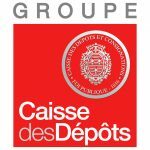 L’académie de Saessolsheim bénéficie du soutien de la Caisse des Dépôts, du Conseil Régional Grand Est, de la DRAC Alsace, du Conseil Départemental du Bas-Rhin et du Crédit Mutuel. 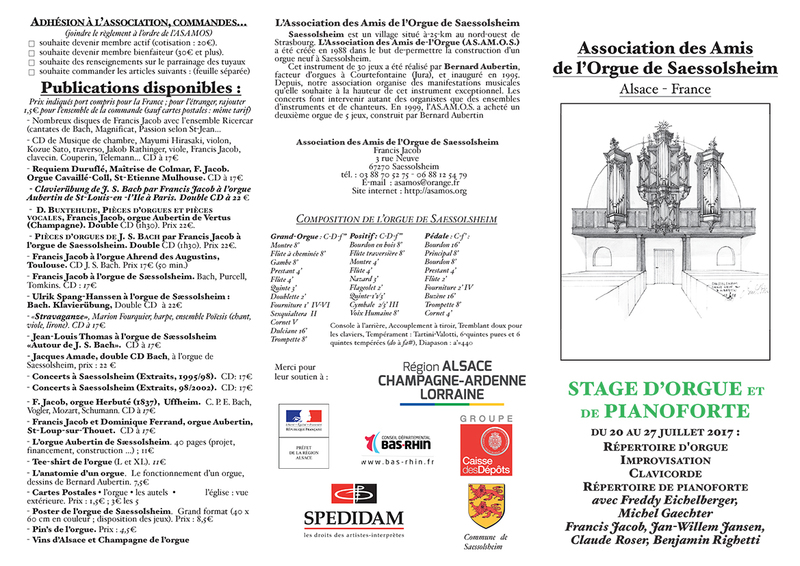 • Organ and pianoforte-academy from july the 20th to july the 27th, 2017 in Saessolsheim (Alsace, France), around the B. Aubertin organ. Theme of the academy : Organ : repertory from baroc to romantic ; improvisation ; clavichord. Pianoforte : Mozart, Haydn, Beethoven (works before 1803). 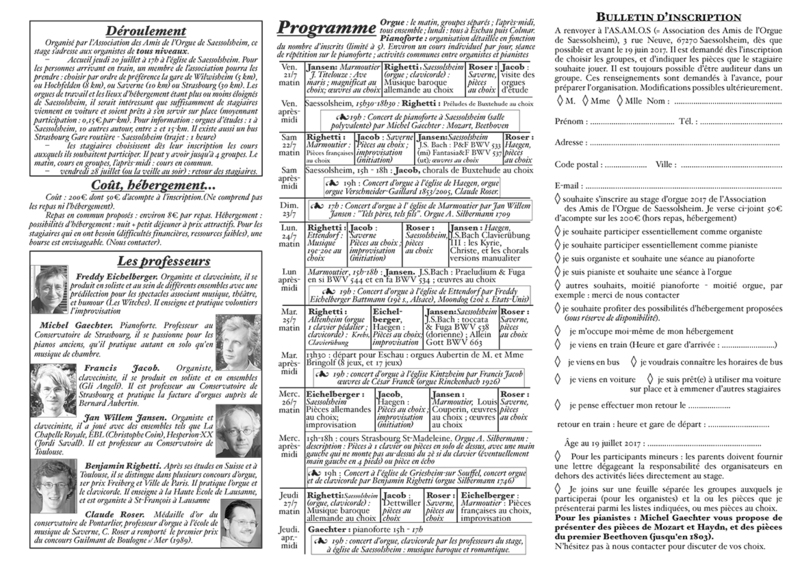 Detailed program : see the document (written in French, but that should not be a problem for people to understand the days, and the titles of the pieces proposed : please click on following link to download that document : dépliant du stage). Most days are organised that way : morning, 4 groups, each one with one teacher, afternoon : all participants together. Monday : all together. 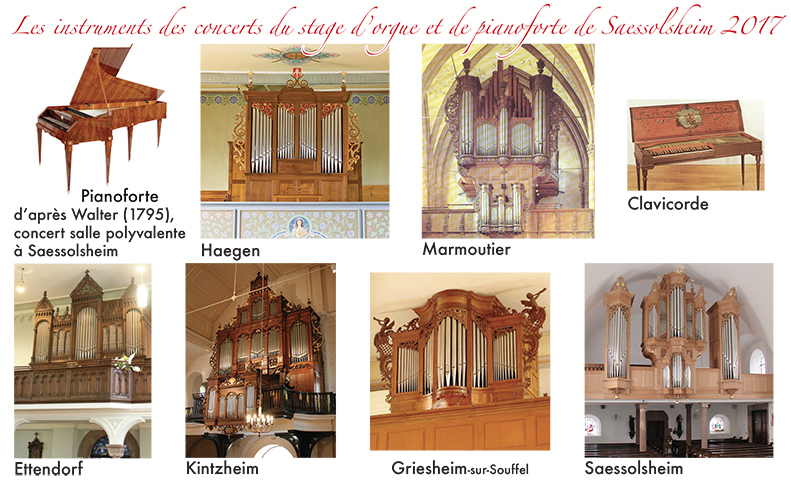 • Organised by the Association des Amis de l’Orgue de Saessolsheim (Association of the friend of the organ of Saessolsheim), this academy is open to organists and pianists of every level. – Beginning Wenesday, thursday, the 20th of july at 5 PM in the church of Saessolsheim. For the people coming by train, a member of our association can take them at the station (there isn’t one in Saessolsheim) : choose best the station of Wilwisheim (5 km from Saessolsheim), or Hochfelden (8 km), or Saverne (10 km) or Strasbourg (25 km). Possibility to come from the airport also. There are also bus from Strasbourg to Saessolsheim. Study organs are available in villages around Saessolsheim. Some solutions for sleeping are also outside of Saessolsheim. So it will be good if the participants who come by car could help to transport other participants. The association will organise exactly those drivings and give some money to the drivers for the cost. For pianoforte : the instrument (copy byTheo Kobald of an instrument from Walter 1795) will be in the salle polyvalente of Saessolsheim. – friday 28th of july (or thursday evening) : back-travel of the participants. The organ lessons are given on the program indicated, and on works on free choice, if there is some time left (normally not so much). Benjamin Righetti gives also some lessons on clavichord. Freddy Eichelberger and Francis Jacob will also work on improvisation. Sleeping : possibilities night and breakfeast for cheap (exact price given after inscription : about 15€ a night), in a center, 15 km from Saessolsheim (single rooms). This possibilities are proposed in the limit of the available places. The association will organise the drivings with the cars of the participants for the lessons. Lunch and dinner organised : about 8 Euros pro eating (with some exceptions). The association will give back : 0,15 Euros pro km to the participants for the ways of the academy (lessons and going back to the rooms for the one outside Saessolsheim, but not for the participants who find an other solution for sleeping, by friends for example). ◊ I indicate the groups I want to participate to (with the name from the pieces I will play).